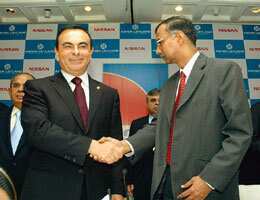 Partners on road: Nissan’s Carlos Ghosn (left) with R. Seshasayee of Ashok Leyland on Monday. 2 min read . Updated: 30 Oct 2007, 12:16 AM IST John Samuel Raja D.
Japanese car maker Nissan Motor Co. Ltd and Ashok Leyland Ltd, which are setting up a joint venture (JV) to make light commercial vehicles (LCVs) in India, will together invest $500 million (Rs1,970 crore) in the project. This is the second venture that Nissan has signed in India. It is already setting up a manufacturing facility with Mahindra & Mahindra Ltd (M&M) in Chennai along with partner Renault SA. Nissan and Renault teamed up in 1999, and the latter holds a 44.3% stake in Nissan, while the former owns 15% in Renault. Separately, Renault makes the Logan car in India with M&M and plans to make inexpensive, small cars with Bajaj Auto Co.
“There would not be any overlapping with other agreements in India," said Carlos Ghosn, president and chief executive officer of Nissan, who is also the CEO of Renault. The Leyland venture will focus on trucks and will make some products that compete directly with Tata Motor Co.’s Ace, which is a market leader in the sub-one-tonne segment. The JV will make trucks in the range of 2.5-8 tonnes gross vehicle weight (GVW). At the lower end of the lower range, a GVW of 2.5 would mean a payload (goods carrying) capacity of 1.25 tonnes. This category has gained in popularity after a court ruling banned overloading of trucks, forcing goods carriers to ship goods to a central warehouse (on large or heavy trucks) for redistribution to multiple locations using smaller trucks. Previously, overloaded trucks would serve several locations, offloading goods as they went along. “This move will transform ALL (Ashok Leyland) from a peripheral LCV player to a significant market participant," said Amit Kosat and Rohan A. Korde, analysts at Motilal Oswal Securities Ltd, in a report released after the initial announcement was made. Leyland “will be able to boast a complete portfolio of CVs (commercial vehicles) once the JVs with Nissan get operationalized", their report added. The manufacturing company will make products under two brand names, Ashok Leyland and Nissan, and there would be “significant price difference" between the two brands, said R. Seshasayee, managing director of Ashok Leyland. The products sporting the Leyland tag will be priced lower than those that sport the Nissan one. Though there will be two different brand names, Seshasayee added that given the equity shareholding between Ashok Leyland and Nissan, the returns to both firms would be same. The Indian CV industry has seen sales slowing in the first six months of the current fiscal on account of higher lending rates; however, sales have grown in the sub-3.5 tonne GVW segment and the more than 16.2-tonne GVW one. From around 10% market share by volume in the truck segment in 2001-02, the sub-3.5 tonne segment now accounts for 30% of the market. Nissan sold close of half million LCVs in 2006. The two proposed manufacturing firms have not yet identified the location for the project to manufacture trucks and engines, but has shortlisted three states—Tamil Nadu, Andhra Pradesh and Uttarakhand—as possible locations for the plants. The technology development firm will be based in Chennai. The truck manufacturing company will initially have a capacity of 0.1 million units per annum, which will be doubled by 2014; production starts in 2010. The engine manufacturing company will also supply to Nissan’s production plants outside India, apart from supplying to the LCV project in India, Seshasayee said. Among the first vehicles being planned for launch is Nissan’s new Atlas F24 light duty truck, which has a GVW of less than five tonnes.